Warren Saunders with his St. Bernard Sam. Grape grower Warren Saunders wastes no time greeting me as I pull into the steep driveway that leads up and around to the back of his farmhouse. Before I can knock, he's heard car wheels on dirt and pre-emptively emerges with a warm smile into the Niagara sunshine in rubber boots, jeans and a crisp blue beret, followed by his daughter, Ann-Marie. I've come to inquire about the current harvest and the challenges of farming organically during the mildew-plagued summer of 2017, which saw unrelenting rains and a record-high level in nearby Lake Ontario. But I'm soon treated to time-travel in the bargain. 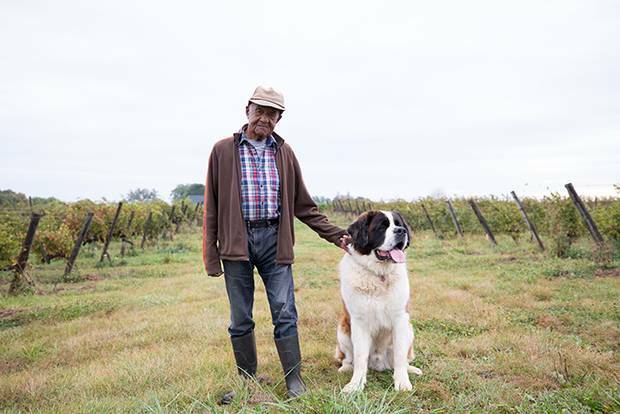 The elder Saunders is 96, a veteran of 52 harvests, during which he's watched the local wine industry go from Baby Duck to biodynamics and crude jugs to trophy bottles. Though still active with household chores on his 17-acre Beamsville property, Saunders last year had to give up pitching in with such vineyard work as shoot-positioning and canopy management after suffering a subdural hematoma, which has brought on additional fatigue. 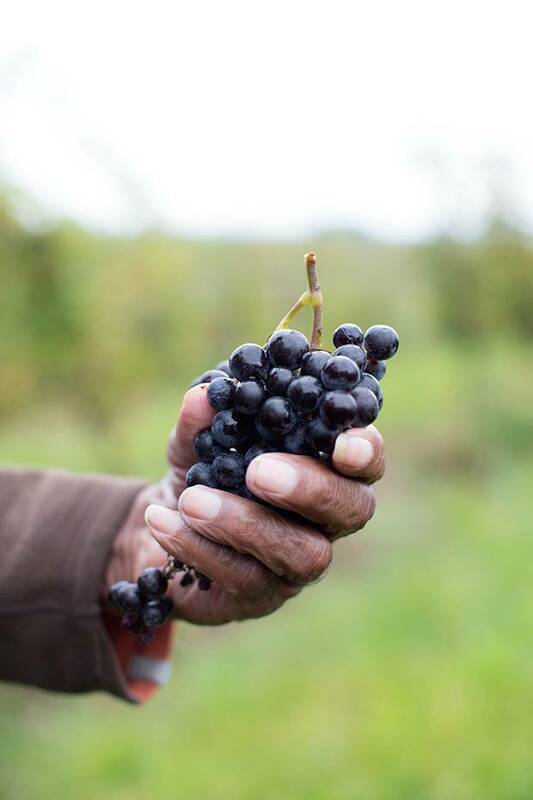 Son Leslie, who lives on-site, and Ann-Marie, who lives 90 minutes away in Toronto, now tend the vines and run the business, hiring temporary vineyard labour as needed. "If it wasn't for them, the place would have been leased out," Saunders says. The Saunders family recently began dealing exclusively with organic producer Southbrook Vineyards as well as Thomas Bachelder, the noted former winemaker for Le Clos Jordanne. Fortunately, the health scare didn't interfere with the pleasure of his favourite alcoholic beverage. "Wine is good, but mostly I drink beer," says the Hamilton native and one-time steelworker. He still drives his Ford F150 pickup – equipped with a booster seat for his slender 5-foot-4 stature – once a week or so to the nearby Jordan House tavern for "one glass of beer and that's it" to hobnob with his younger, seventy-something friends. Before we sit down at the kitchen table, father and daughter treat me to a stroll among the vines with Sam, a hyperactive, four-year-old St. Bernard who looks burly enough to carry Saunders on his back. They show me bruised leaf canopies, scarred canes and malformed clusters among the merlot and young pinot noir vines, painful evidence of their first-ever hailstorm, the date of which – June 26 – Ann-Marie remembers vividly. "Then there were really hard, pelting rains, sort of almost horizontal," she says. "They would hit the berries and the seeds would pop up a little bit out of the berry. It was an unusual developmental year, pretty much different from all others." The main upshot: a lighter crop. But, mercifully, fears of overly tart, underripe berries were mostly assuaged as September and early October brought dry, sunny conditions. Devoted to organic farming since 2010, the family was forced to combat an onslaught of downy and powdery mildew mainly by mechanical means, with a new tractor attachment that delicately mows beneath vines to reduce runaway weed growth, permitting the reliably strong winds atop the Beamsville Bench escarpment to better aerate vines. Though the family has sold merlot, riesling, cabernet franc, pinot noir and chardonnay to a variety of estates that sprouted in the vicinity during the past quarter century, such as Cave Spring, Peninsula Ridge and Malivoire, they recently began dealing exclusively with organic producer Southbrook Vineyards as well as Thomas Bachelder, the noted former winemaker for Le Clos Jordanne who now has his own label. Some of the chardonnay will end up in a $45 handcrafted Bachelder white bearing the designation "Saunders Vineyard," a point of pride for the 96-year-old farmer. "Our name should be on there because this is where they got the grapes from," he says. Saunders, a former Stelco employee, whose father emigrated from Jamaica to work at the other Hamilton steel giant, Dofasco, could not have foreseen his name on a luxury wine when he and late wife Ivy paid $27,000 for the land in 1965. Not only was there no serious wine industry to speak of, the farm itself was like something out of the 1960s sitcom Green Acres, with a flooded basement and a collection of machinery that, to the couple's surprise, was derelict and worthless. It turned out the vendors had unscrupulously staged the barn with flashy new tractors and accessories for the real-estate viewing only to remove them after the sale. A desperate call by Saunders to his lawyer and one-time Stelco colleague, Lincoln Alexander – who would become Canada's first black member of parliament and Ontario's 24th lieutenant governor – sadly proved fruitless because of an oversight in the contract's fine print. Back then, the couple grew tree fruit and table grapes, selling their bounty at weekend farmers markets from the cargo bed of their pickup truck. In the early years, it was Ivy, who was Jamaican-born and educated in England, that did most of the arduous field work after giving up her nursing career at Hamilton General Hospital. Warren, meanwhile, kept his day job casting giant ingots in the torrid Stelco furnace room. "I retired when I was 63," Saunders says with a smile, recalling his starting pay, 43 cents an hour. "I had 42 years in the plant, and when I went to retire, they said, 'Warren, you look good.' I said, 'Yep, I gave you 40 years to kill me and you ain't getting another day.'" A half-century of work on the farm appeared to take a serious toll on Ivy, however, who passed away in 2015 from Parkinson's, a disease linked to, among other things, pesticide exposure. The farm's tree fruits in particular, long since removed to make way for quality wine grapes, required assiduous pest control, Ann-Marie recalls. "My dad would come and spray and he would have full-on protection. But my mum would handle a lot of the fruit personally… Anecdotally, she was convinced that there was some effect." Saunders and his daughter Ann-Marie grow grapes on the Beamsville land the family bought in 1965. As Niagara morphed into a bona fide wine region, the peaches, cherries, plums and pears and the inferior labrusca grape varieties that the family had delivered by the truckload to the weigh scales of industrial wineries gave way to noble vinifera species and more meticulous trellising and pruning. It also enabled the family to embrace, at Ivy's urging, organic viticulture, which coincidentally dovetailed with today's fine-wine sensibilities. "They're visionaries in the sense that they plunked themselves down before the wine industry began and as the wine industry began, they realized that they were sitting on something that needed to be honoured," says Bachelder, who also makes wines in Burgundy and Oregon for his private label. 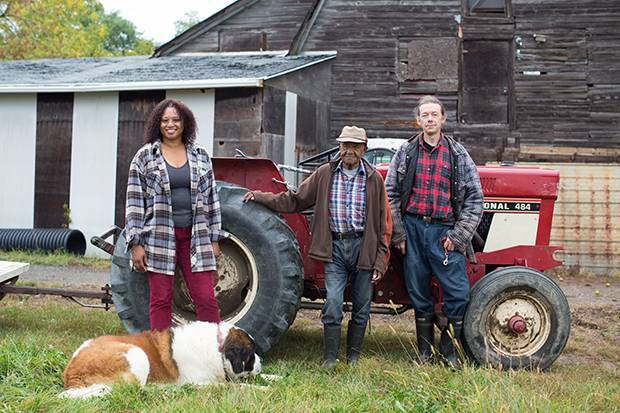 The Saunders family has done more for the region than tend their own farm, too. A couple of decades ago, Ivy spearheaded a crusade to legalize "bird bangers," propane-fired devices that make a cannon-like sound to scare flocks away from ripening fruit. The campaign prevailed despite intense opposition from the growing residential population of Niagara's urban sprawl. Even today, the province's grape growers lose an estimated $4-million a year to bird predation, according to Grape Growers of Ontario. Although Saunders clearly was blessed with good genes (the antique tube radio next to his kitchen table belonged to a stepsister who passed away at 99), he gives at least some of the credit for his stamina to plenty of vegetables in youth as well as his active retirement. "You gotta keep going, you just can't sit around," he says. I can't resist informing him that his 17 acres of prime vineyard land would fetch him a pretty penny today, and I ask if he'd ever consider moving or scaling back. "I wouldn't sell it for under $5-million," he says, shaking his head. Adds Ann-Marie: "He's very attached to it." Editor’s note: Due to an editor's error, an earlier version of the headline on this story was mistaken in calling Warren Saunders an immigrant. He was born in Canada. This version has been updated.